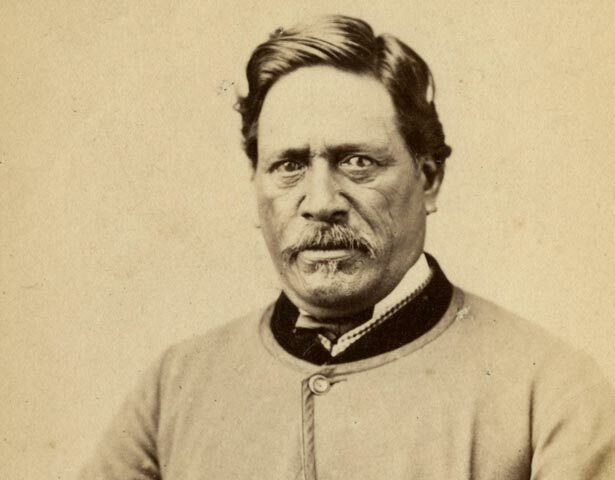 Wiremu Tako Ngātata, of Te Āti Awa, usually known as Wi Tako, was a chief born around the beginning of the nineteenth century in Taranaki who migrated south in 1832 with his people to the Cook Strait region. His father signed the Treaty of Waitangi in the Wellington region in April 1840. Wi Tako was involved with the settlement of Wellington in the 1840s, including some of the questionable deals pushed through by the New Zealand Company, but his evidence to the Spain Commission enquiring into early land deals earned him opposition from early settlers. He was literate in Māori and used his skills in letters to officials and newspapers to defend his and his people's interests. He was angered by the intolerance and discrimination he experienced from the early settlers and took a leading part in the deliberations at Ōtaki in 1853, which promoted the idea of a Māori king. But his support for the King Movement was pacific in nature, and following the Government invasion of Waikato in 1863, he withdrew his support from the movement. In 1872 he was appointed to the Legislative Council, one of the first Māori to be a member. Here he opposed legislation threatening Māori possession of land. He died on 8 November 1887 at his home in the Hutt Valley. We have 40 biographies, 9 articles, related to Wi Tako.